Wearing Google Glass is an amazing experience, but $1,500 is really expensive! What if you could make your own wearable computer for under $200? This hack comes to us via Adafruit, and features a pair of those movie-screen glasses, and a Raspberry pi. The full tutorial can be found here, but we’ve summarized it for you below. The displays for the glasses are harvested from a pair of “video glasses” which can be had for around $110. Each one comes with two displays, so you can actually build two pairs of home-made glass for every pair you buy. 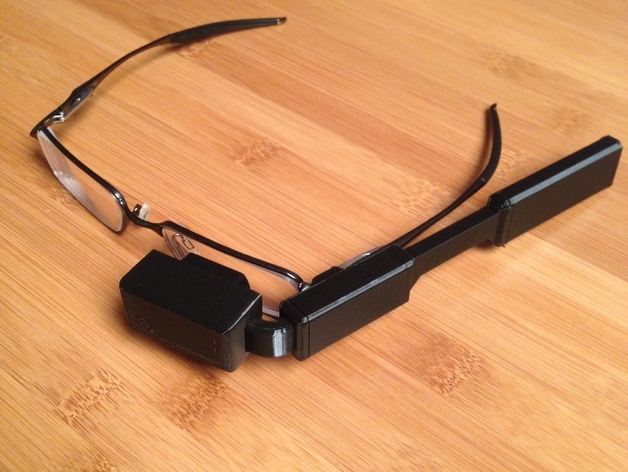 “My next project: building my own #Google Glass! The display is then mounted into a 3D-printed housing that is similar in design to Google Glass, along with circuit boards for controlling display. You can find the 3D file for the housing here. Your 3D printed casing has built-in input ports, so that you can connect it via cable to any computer. For their tutorial, Adafruit used a Raspberry Pi with a USB battery pack for portability, clipped onto the wearer’s belt. Since the OS isn’t really optimized for a tiny display, it’s probably hard to control, and not very practical, but it’s cool that you can build this nonetheless. “I’m building my own #Google Glass!